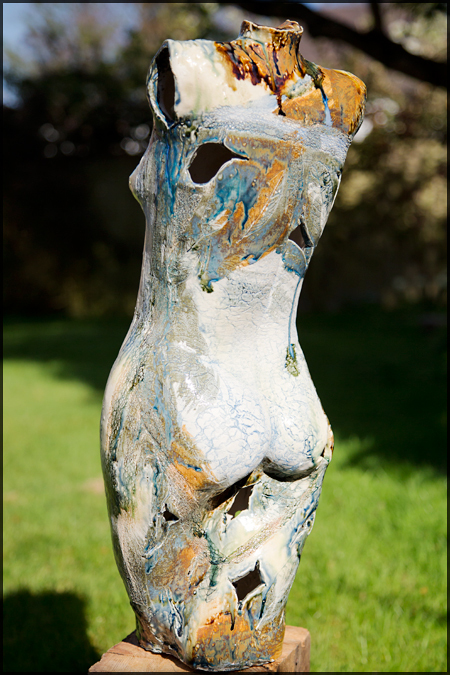 This stoneware fired torso is suitable for display in the garden or indoors. The clay is impressed with ferns, lace and other marks while still soft. After the bisque firing, glazes and oxides are brushed and poured on. It is then fired to around 1240°C. I have an idea of how the glazes will colour, but the end result is serendipitous as I cannot predict exactly how the glazes react with each other. Opening the kiln is always a hold my breath moment – joy or back to the drawing board? The plinth is wood, rescued by scavenging in skips, construction jobs and reclaim yards. It has been sanded, charred, polished and embellished with metal additions. Hopefully it will be on display during our Bucks Open Studios event in June. Click on Exhibitions and Events for further details. This entry was posted in New work and tagged Garden sculpture on May 5, 2015 by Carol.